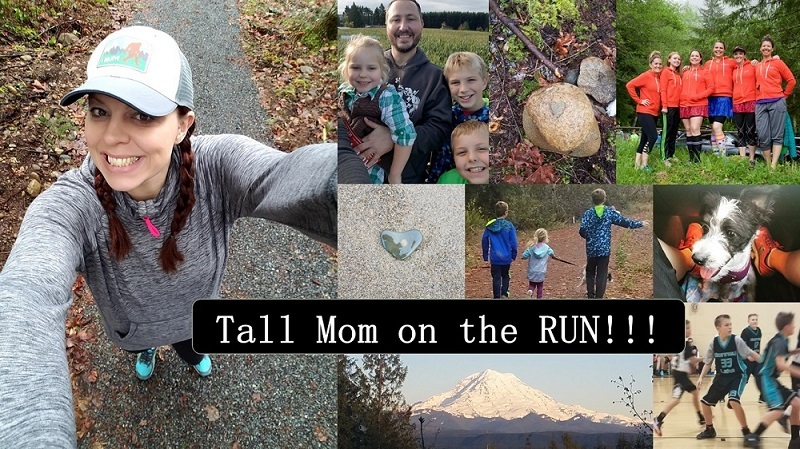 I had a 10-12 miles run planned, my last LONG Run before Seattle Rock N Roll Marathon. Mother Nature had other plans. 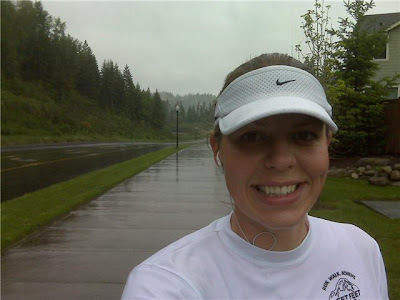 Living in Washington I know RAIN and I run in RAIN. But there are different forms of rain. A scale from light drizzle to outright downpour. Yesterday was rain SHOWERS! And silly me did not fully prepare for the RAIN. I wore a visor when I needed a hat, and a long sleeve shirt with ZERO rainproof qualities, and a Running skirts. OOPS!! No wonder I made it 5.2 miles and called it for RAIN. When I got in my car I noticed a puddle had formed in the elbows of my shirt, WOW! Rock N Rollers, be sure to prepare for RAIN! You never know what race day will bring. I hope to get in a longer one today with my AMAZING Hubby Muscle Man. He is in for a Fathers Day full of running, grocery shopping, buying patio supplies at Home Depot and listening to the little studs WHINE ALL DAY!! Fun. What are you doing this Lazy Sunday? What is the worst RAIN you have run in? G and I ran a 16 miler in downpours while we were both sick. Marathon training will do crazy things to you. And we raced a 5K in a tropical storm. So few people showed up that I placed second. And I was pregnant. And I had to push a double stroller. The worst rain I have run in was a few weeks before OKC marathon where it freaking poured. I was supposed to do 18 I think but ended up with 12. the rain turned to freezing rain and sleet! What in the world? I could not believe the downpour...it was Midwest style rain, pelting rain. Good job getting 5.2 in! so glad I got my run done Fri! have a fun-filled Father's Day! My lazy Sunday consists of finishing up my packing and heading to St. Charles for the beginning of a week long bike ride on the Katy Trail. Yea! I've been looking forward to this since last year's ride ended. I haven't run in the rain, but I've played volleyball in the rain more than once. Last year, at the mud volleyball tournament we play in each year, it rained ALL day on the Saturday. Even though it was July and typically mid 90's, we shivered on a chilly day with cold rain. And since you're slogging though mud to play and every bit of clothing weighs you down (or falls off and disappears), there's no dressing for the rain. You just have to play through and be glad for hot showers back at the hotel! Don't you love this June-uary we're having in WA? Luckily, we didn't get rain yesterday up here in Bellingham. Last year it was pretty warm for the R&R, hopefully you'll get good weather next weekend! It's crazy thinking of that much rain when it's around 100 ( a bit cooler than usual for this time of year) here in AZ! Good luck next week! Are you ready? Good for you getting out there! I live in the NW too but haven't really gotten used to running in the rain. I did run during a POURING rain storm. I was trying to beat the thunder and lightning storms that were predicted for the afternoon. It ended up being one of my faster runs! Haven't run in the rain but I rode in a horse show where it was raining so hard that there was a waterfall off the brim of my hat and my boots filled up with water while I was riding. Earlier this week, we had hail and crazy winds. My power was out for at least 5 hours. Not fun. I only ran in the rain once - it was quite a neat experience. Man, those roads are wet. The worst run I had in the rain was a race a few weeks ago. My Running Skirt got so wet that I thought it was going to fall down to my ankles; I had to check a few times to make sure it wasn't slipping too far below my hips. i ran 16 miles one time in thunder and lightening while the contractors were renovating my new house. i kept swinging by to make sure everything was ok...they kept looking at me like i was nuts. I ran in a half marathon that was windy and freezing as well as raining. I could hardly manipulate the key to open my car door. No hanging around after the race, home to the woodstove that I called to make sure my husband had going! The worst rain I ran in was the other day--I can handle rain in all varieties especially since it is 95+ degrees down here in Mobile, Alabama--BUT, OMG, the lightening bolts caught me and truly had me running scared. I don't think I've ever been so freaked on a run but it was a severe storm with no available shelter. I actually like to run in the rain when it's drizzling or lightly falling. But, when it's a downpour...no thank you! Way to get in 5 miles in that! I think I would have called it quits much sooner. I got caught in a freak monsoon a few years ago. A friend and I set out for a walk with SailorBoy in the stroller (he was 5 months old.) When we started it was sunny and 80 degrees. A mile from the house a monsoon hit and we were completely drenched in about 1 minute. We raced home but had to endure the dirty looks of passing drivers thinking "Why is that horrible mother taking her baby out in this storm??" So embarassing. Ran ten in the drizzle today. Worst rain I ever ran in was a couple weeks ago. Someone actually pulled over and asked if I wanted a ride home LOL. I said No thanks and No way. This is the best to run in, I don't have to shower when I get back. We have had a lot of aquatic training this month! I really hope it doesn't rain for Rock n Roll! I have to say I enjoyed running in the rain today until I reminded myself it is JUNE! Too funny about Falling Water! I like running in the rain as well, but dislike running when it is so hard that my shoes start to slosh. Great that you got out for your last long run. I LOVE running in the rain! Note to self: PACK RAIN GEAR! one of the most memorable rains was my first half...we went down to Huntington beach, CA in february thinking we would be leaving the pac-nw rain at home. Oh no. Pouring rain and WIND. Crazy race. Crazy weather. I hate running in sloshy shoes. That is the worst part of 'rain running'. Good luck on Saturday.